(Anchorage) - It’s time to get out and fish. Together. Over the coming weekend Alaskan angling families will have the opportunity to participate in several different youth or family fishing events across the state. 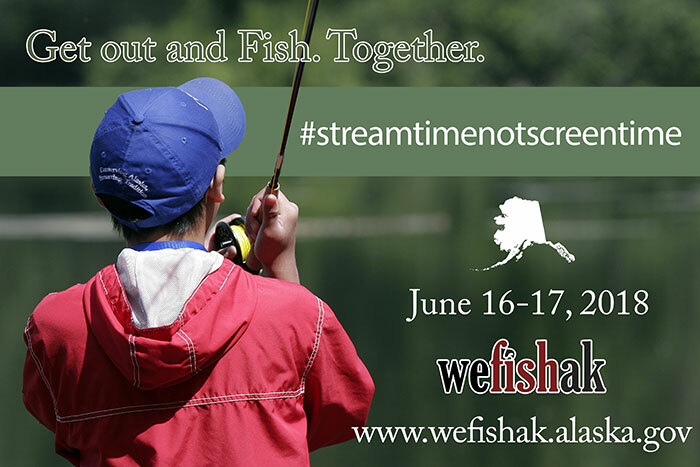 The Division of Sport Fish encourages anglers to share their fishing stories using hashtags #streamtimenotscreentime and #wefishak. The Division of Sport Fish can be found on Instagram @wefishak and on Facebook at www.facebook.com/wefishak/. Saturday, June 16 from 6:00 a.m. to 6:00 p.m. at Ship Creek. The section of Ship Creek from the C Street bridge upstream to the Bridge Restaurant will be open to fishing for anglers 15 years of age or younger. ADF&G staff will be in hand to distribute fishing equipment and bait. In addition, The Bait Shack will be on hand distributing various prizes and serving food. On Saturday the high tide is at 9:30 a.m. so the best fishing times are from 7:30 a.m. – 11:00 a.m.
Don't forget your harvest record card! Saturday, June 16 from 6:00 a.m. to 6:00 p.m. at the Eklutna Tailrace. The Eklutna Tailrace will be open to fishing for anglers 15 years of age or younger. ADF&G staff will be on hand to provide fishing information. Saturday, June 16, Reflections Lake is the place to be. The popular recreation area, located at Mile 30 Glenn Highway at the Knik River Access exit, will host a family-friendly celebration of the Palmer Hay Flats State Game Refuge from 11:00 a.m. to 3:00 p.m.
Activities will include nature walks, bird identification instruction, a live bird presentation, bear spray demonstrations and fly-casting classes. And speaking of fish, anglers young and old can follow the action as the Alaska Department of Fish and Game releases a fresh batch of rainbow trout into Reflections Lake – don’t forget to bring your fishing gear! Sunday, June 17 from 11:00 a.m. to 3:00 p.m. at Cushman Lake in the Tanana Lakes Recreation Area. Bring your own fishing equipment and bait. Loaner equipment and bait will be extremely limited. ADF&G staff will be on hand to help and will provide general fishing information about the area. Sign up to win door prizes.